Caution: The following article may cause you to itch!! Unfortunately we ran into some Poison Ivy while clearing roses at Wheaton Hill a few weeks back. And Don and I previewed the Cresent Trail route for June 30th and saw quite a bit more. So, with lots of help from Don, here is some information about Poison Ivy for all of you who enjoy getting out on the weekends. LEAF (AND PLANT) – A very NON-detailed description of the poison ivy leaf (compound leaf) is that it is made up of three leaflets, two leaflets form a pair on opposite sides of the leafstalk, while the third leaflet stands by itself at the tip of the leafstalk. Leaf size can greatly vary, as can color and numerous other characteristics. While this stark base description must be added to, to be more useful, for the wholly uninitiated the saying “leaves of three, let them be” may serve well, because it just could be poison ivy. The stems, vines and roots all contain the same irritant that is contained in the leaves, and in all seasons!. Poison ivy comes in more than one form. Basically a vine, it creeps on top of the ground and underground, it climbs and hangs from trees and bushes, and occasionally becomes a bush itself, It is chameleon like in that it has several different appearances in many different seasons, and even in the same season. FAVORED GROWING LOCATIONS – A favorite type of place for poison ivy to grow and flourish is at a transition area – the edge of a road, field, forest or water source. You’ll not likely find poison ivy in the middle of a field, but put a shed or other structure in the middle of that field and you just may have created a homey location for poison ivy to take-up residence, you’ve created a transition area or edge. 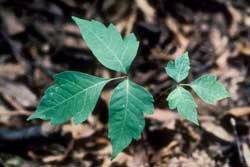 THE TOXIN – Urushiol (you-Roo-shee-ol) oil or resin is the active irritant in – Poison Ivy. Urushiol oil causes a contact dermatitis rash in many humans which can be quite bothersome and painful and can last many weeks or months, and can appear to spread on the body once contracted. Proper treatment and care are important in an attempt to prevent worsening symptoms or scenarios. While some humans seem immune to it, such immunity if present can change. So just because you have never had poison ivy and know you have come in contact with it, do not think you will always be immune to it. The more times you come in contact with it, the more likely you may develop an allergic response to it. CONTACT – Poison ivy exposure can be contracted not only by direct skin contact, but also by contact with anything that has been in contact with the poison ivy and still has the oil on it, such as clothing, hats, tools, dogs and other animals (hello, deer hunters and other game hunters) Apparently dogs are do not get a rash, but they can pick up the poison ivy oils on their coat and serve as source to cause it to come in contact with you. Bruising or crushing the plant highly increases urushiol oil exposure, so a dog rolling in it is a bad scenario. Wash your pets with lots of water to remove the usushiol. Caution should be exhibited when so as to avoid transfer of the urushiol oils to the dog’s bather. DERMATITIS RASH ONSET – If this is the first time you have had an allergic reaction to poison ivy, the rash usually takes about 7-10 days to show up after exposure. The rash usually appears much sooner after the next exposure. TREATMENTS – There are numerous treatments (or said treatments) for urushiol contact dermatitis rash, including washing with cool water quickly after possible contact (note: hot water opens pores and serves to more easily facilitate urushiol permeation thru our skin’s somewhat protective barrier, which you do not want, SO DO NOT USE HOT WATER TO WASH OFF URUSHIOL), to a prescription from a doctor for the steroid MethylPREDNISolone tablets (taken orally). Check the American Academy of Dermatology for additional tips. The best way to prevent a rash is to avoid the plants and to protect your skin from contact. Don has suggested the website http://www.poison-ivy.org for lots of information about Poison Ivy. This site has many pictures showing different stages of the three leaves, and uses humor to keep you interested. I like the picture of the poison ivy shrub in the winter – it still contains the oil. A tutorial site with a poison ivy quiz. A couple of sites just about Poison Oak and Poison Ivy. A site with some serious scientific information.